Officer in Charge Traffic Operations, Acting Station Sergeant David Wills. Photos: George Tsotsos. 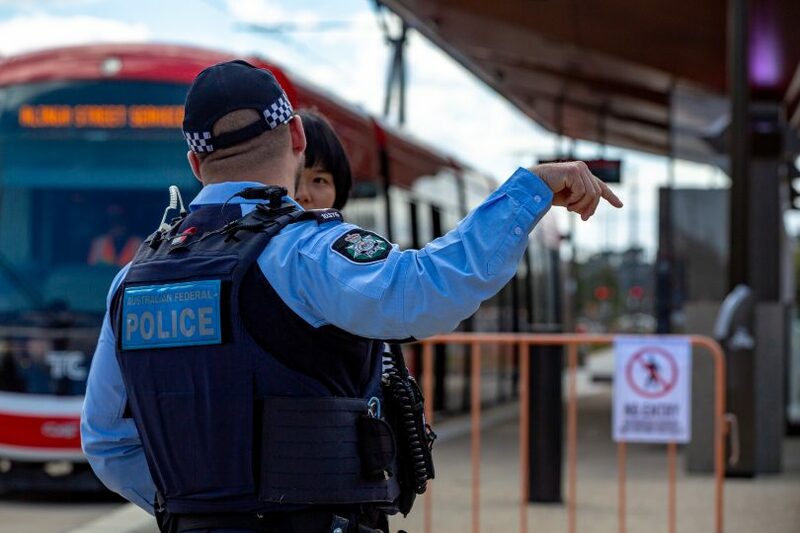 ACT Police say the number of close calls between motorists/pedestrians and light rail vehicles is disappointing but not unexpected as the light rail launch day nears. A video released by the ACT Government on Friday morning (12 April) showed a series of cars failing to obey the signals and entering intersections in front of the LRV as well as pedestrians making a mad dash in front of the moving vehicle. 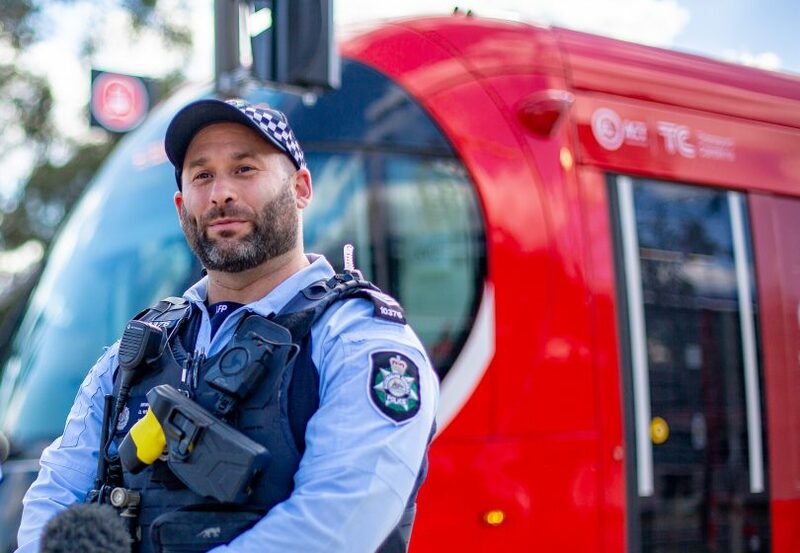 Over the past three weeks, ACT Policing members have targeted the light rail route from the city all the way Gungahlin to observe the behaviour of motorists and pedestrians around the corridor. Officer in Charge Traffic Operations, Acting Station Sergeant David Wills said police would use their discretion whether to fine or just caution motorists or pedestrians failing to comply with road rules. “Disappointingly, earlier this week there were some offences that were noted like mobile phones, seat belts, not giving way when they should and pedestrians crossing when they shouldn’t,” he said. “There has been a period when we focused on the education side of things. However, there have been circumstances where the activity that has occurred hasn’t warranted caution and a fine has been given. Acting Station Sergeant Wills says fines could be enforced on pedestrians refusing to obey road rules. Acting Station Sergeant Wills reminded motorists and pedestrians that fines could be enforced. “For most of the pedestrian fines, if we are looking at crossing against signals, I believe it’s around $150 for the infringement,” he said. “What will happen is that the police officer that will speak or deal with that person will assess the circumstances and will make a decision whether it will be a caution or a fine. “It may even be the case of multiple fines. Acting Station Sergeant Wills stressed that the road rules are simple and easy to follow and reminded Canberrans to have safety at the forefront of their minds. “Light rail is something new that the community of the ACT is going to have to get used to,” he said. “The near-misses are pretty confronting when you consider that any collision between a light rail vehicle and either a pedestrian or a vehicle has the potential to be a tragic one. “For road users, things have changed and things will be different but in a very short time, they will become the norm. Until that happens, it is important that road users take heed of the advice we are providing. “The signs are very clear and very obviously displayed. It IS a bit of a worry isn't it!!?? I'm wondering if it's a case of ppl just not being used to them? Wait until it’s up and running...Car Insurance is going to hit the roof! its about time some thing has to be done before some one will get hurt or worse . I have seen it before it happens all the time in Sydney and the gold coast and Melbourne and Brisbane . Robbie Wallace ummm not sure where you are looking but they do have orange lights. Oh they don’t have green though, they have white instead. Confused about it saying there has been a period of focus on education... the things aren’t even running officially yet, there has not been anywhere near enough education on the rules... not everyone is going to be confident around the light rail. Surely the period where they should be educating people is now?? Ellie Marks so what exactly do you want in the way of education? The road rules are the same, the rules of life (read survival) are the same. What else is there? And how do you want that delivered? I actually work in delivering road safety... I’m not an idiot thanks Ashley... well aware that survival is key... where are the updates to the Road Ready course about driving around light rail? Who is educating the older drivers about traffic movement around these areas? More printed updates to the road rules, ads, things like that? The same way we did things when smoking in cars became illegal, or when the age for use of child restraints increased. The same way we made sure people knew that the blood alcohol level was zero for p platers when it had been 0.02 for a long time. Otherwise, the same near misses are just going to keep happening until someone is killed. Ellie Marks how is light rail any different to normal driving and crossing the road. The rules are all the same. Why does there need to be any special education? Now if the road rules changes different story. Yep once all the stopped ones have been knocked over! With all the advances in medical technology, natural selection rarely gets a look in these days. Just don’t drive anywhere near the tram line. Does it say "CLEAR KEEP" because the word "KEEP" seems to be at the bottom ...... ? Daniel R Burns I have some money on this intersection being the first for there to be an accident. Whilst what the person in the photo has done is dumb, this intersection could have been done a whole lot better. The different hold lines for turning and straight confuses some people, the way the overhead lights are done above the turn confuse people too. So many people step in front of my car when I’m driving around Canberra assuming that I’ll brake. It’s a bit easier for me to stop than a tram but it’s a pretty arrogant attitude. I’m talking adults who should know better. Where are you driving; on footpaths. Can't the government do the thinking for me? And can't they take responsibility for my actions too? Just let them. Let nature sort out the weaker of the herd. Only the strong and smart will survive.